The most popular member of the mutant X-Men team, the claw-bearing Wolverine is “the best there is at what he does,” according to him, but what he does isn’t pretty … just pretty violent. A grumpy loner by nature, Wolverine is short, extremely hairy, and possesses a combination of mutant powers and scientific enhancements. His past has been—until the 2000s—shrouded in mystery, with false implanted memories and a century-plus lifespan complicating matters. Introduced in The Incredible Hulk #180-#182 (October-December 1974), Wolverine was created by writer Len Wein at the behest of Marvel’s then editor-in-chief Roy Thomas, who wanted a Canadian hero to bring in more north-of-the-border sales potential. Although artist Herb Trimpe drew the Hulk stories, it was Marvel art director John Romita Sr. who designed the costume and clawed look of Wolverine. The yellow-and-blue costume didn’t exactly remind readers of the ferocious woodland animal, but the trio of claws Wolverine could pop out of the back of each hand (with a “snikt” sound effect each time), and the character’s surly, violent attitude, made him stand out from other new heroes of the time. As would eventually be shown, Wolverine is a dangerous loner, in the tradition of the Western anti-hero; he has no compunctions about killing, but treats the helpless well as long as they don’t give him a tough time. He is, in short, Clint Eastwood with tights and claws. Unlike many traditional heroes, Wolverine is flawed, but it is his battles with those flaws—and an occasional “giving in” to his nastier impulses—that make him a popular character, especially among male fans. Wolverine was soon transferred to the pages of the revitalized X-Men series with Giant-Size X-Men #1 (Summer 1975), where he stayed in the background until artist John Byrne came onboard to work with writer Chris Claremont (X-Men #108, December 1977). Claremont and Byrne soon developed the scrappy character further, revealing that his mutant powers included tracking abilities, plus a healing factor that also slowed his growth; those powers had enabled him to survive an as-yet unexplained process whereby his entire skeleton had been coated in the Marvel Comics uber-metal known as adamantium. The creators also showed that he had previously been a Canadian operative of Department H, and that he had worked with the Canadian supergroup Alpha Flight. Wolverine developed a crush on red-headed teammate Jean Grey, although he eventually fell in love with a Japanese woman known as Lady Mariko Yashida. Even as he found love, though, Wolverine still batted to control the violent “berserker rages” that threatened to break out of his unconscious and turn deadly for those near him. The Japanese connection was explored further with the first Wolverine miniseries in 1982, in a much-lauded story by Claremont and artist Frank Miller. It was clear that Wolverine—whose name had already been revealed to be Logan, and whose costume had been changed to a more animalistic brown and tan—had experienced both martial arts and samurai training in his past. 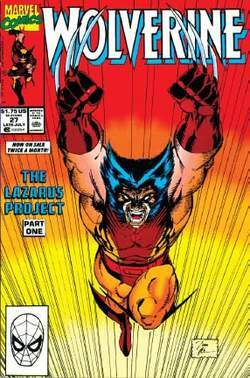 In November 1988, Wolverine was awarded his own regular monthly series, at which point the character spent more time on the Pacific island of Madripoor, running a bar while disguised as a ruffian known as “Patch.” The anthology series Marvel Comics Presents debuted in September 1988, featuring a Wolverine serialized story in almost every issue. The most famous of those serials— a story known as “Weapon X”—ran in issues #73-#84 (March-September 1991). This story showed the experiments by which Wolverine’s skeleton was covered with adamantium. In X-Men #25 (vol. 2, October 1993), the mutant villain Magneto forcibly removed the adamantium from Wolverine’s skeleton and claws; the anti-hero struggled without his indestructible skeleton, but used the bone-claws that jutted from the backs of his hands just as effectively. The villain Apocalypse eventually re-bonded adamantium to Wolverine’s bones. Still a loner, Logan has taken time out of his brooding, violent solo adventures to mentor some of the younger X-Men members such as Jubilee, Kitty Pryde, and others. He’s also continued his pursuit of Jean Grey, much to the frustration of Grey’s boyfriend, Scott Summers (better known as fellow X-Men member Cyclops). Almost thirty years after he first appeared, the backstory for Logan was finally revealed in the six-part Origin miniseries (November 2001-April 2002), which was set near the end of the nineteenth century. Born James Howlett in Alberta, Canada, he is the sickly heir to a fortune. With a completely withdrawn mother and a busy father, James is cared for largely by a hired playmate, a red-haired girl named Rose. James has a peculiar relationship with “Dog,” the rough-hewn son of the wild-haired family gardener, Thomas Logan; but as time wears on, the relationship spoils. After the gardener kills James’ father, bony claws protrude from young James’ hands for the first time, resulting in the death of Thomas (and leading to the suicide of James’ mother). To save him from further trauma, Rose takes James to a mining colony to grow up, giving him the name Logan. As he enters puberty, James’ mutant powers begin to manifest themselves more, but a later confrontation with the now-feral adult “Dog” leads to tragedy. While Origin gave the foundation for Wolverine’s past—including the fact that his healing ability helps to block out memories and mental trauma as well as heal physical wounds—many more questions remained to be answered. The Marvel Comics writers and artists will have plenty of time to tell these stories; Wolverine and X-Men remain among their most popular titles, and guest-appearances by the scrappy Canadian fur-ball guarantee strong sales in any comic. Multiple “alternate future” titles have postulated that Logan will be one of the last survivors among Marvel’s heroic pantheon as well. For example, writer Mark Millar and artist Steve McNiven devised the storyline “Old Man Logan” (in Wolverine #66-72, 2008-2009), which is set in an alternate future in which supervillains have conquered the United States, most superheroes are dead, and a now aged Logan refuses to use his claws again. This inventive story has since been published as a graphic novel. As a result of the Scarlet Witch’s reshaping of reality in the miniseries House of M (20052006), Wolverine has regained all his lost memories. In 2006, Marvel launched a second Wolverine solo series, Wolverine: Origins, in which Wolverine investigates his rediscovered past. Perhaps his most startling discovery was that he has a son, Daken, who has claws and superpowers like his own; Daken debuted in Wolverine: Origins #10 (March 2007). Trained to be a living weapon by Wolverine’s enemy Romulus, Daken became Wolverine’s adversary. Though he rebelled against Romulus, Daken continues his criminal career. Another character, Laura Kinney, alias X-23, is a female clone of Wolverine. She first appeared in a 2003 episode of the animated TV series X-Men: Evolution, moved into the comics in NYX # 3 (February 2004), and received her own comics series in 2010. Although Wolverine seems to be a loner by nature, he not only continues to be a member of the X-Men but joined the Avengers as well in 2005. Cyclops had Wolverine found a new version of X-Force in 2008. As played by Hugh Jackman, Wolverine made a strong impression in the first live-action X-Men film in 2000. Jackman returned to the role in the sequels, X2: X-Men United (2003) and X-Men: The Last Stand (2006). 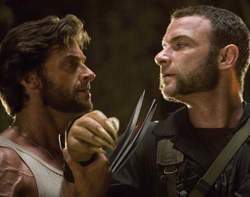 Jackman then starred as the lead character in X-Men Origins: Wolverine (2009), directed by Gavin Hood, with Liev Schreiber as Sabretooth, and released by Twentieth Century Fox. Jackman even has a cameo in X-Men: First Class (2011). Fox is developing a new film, The Wolverine, which will again star Jackman, and will be based on Claremont and Miller’s classic 1982 comics miniseries. Gulo gulo. A carnivorous mammal which is the largest and most vicious member of the family Mustelidae. Originally chartered in 1933 and headquartered in Midland, Michigan, Wolverine, through its wholly-owned subsidiary Wolverine Bank, serves the Great Lakes Bay Region of Michigan with three full-service banking offices. Hugh Jackman has stuck with his role as Wolverine for fourteen years ((http://cdn. The aim of our study was to estimate the total kill rate on reindeer at different relative abundances of lynx and wolverine using published data on diet and food requirements for lynx and wolverine, taken together with the meat available on killed reindeer. The Wolverine can cross 73 percent of gaps theater-wide, compared to the AVLB's 54 percent. To this day, a radio-collared wolverine may be beeping away and no one is listening. The wanderer: what drives the wolverine's seemingly insatiable need to stay on the go? Wolverine continues to evolve the Contour Welt collection by adding additional design and performance features, which deliver all-day comfort and protection with each step. While Wolverine first created gloves during World War II, its apparel and gear line truly took off in 2006. Shown to retailers at the end of 2007 and hitting shelves in early 2008, Wolverine created the Contour Welt([TM]), a revolutionary, never-before-seen design setting new standards in comfort and flexibility for work footwear. Designed to deliver flexibility in the forefoot and support in the instep areas, the Wolverine Contour Welt offers the flexibility of a sport shoe with the support of a traditional work boot. Wolverine has incorporated comfort and ease-of-wear details into the jacket, including no side seams and reinforced pocket openings. Winning this award each year since its inception is an outstanding achievement for the Wolverine brand," said Ted Gedra, president of the Wolverine Footwear Group. Wolverine undertakes no obligation to publicly release any revision of any forward-looking statements contained herein to reflect events or circumstances occurring after the date hereof or to reflect the occurrence of unanticipated events. Wolverhampton Community Radio Training Ltd.